Russia told the United Nations Security Council there was no point establishing a new inquiry to determine blame for chemical weapons attacks in Syria because the US and its allies had already acted as judge and executioner. United Nations: Russia told the UNSC on Tuesday there was no point establishing a new inquiry to determine blame for chemical weapons attacks in Syria because the US and its allies had already acted as judge and executioner. The 15-member council met for the sixth time in the past nine days on Syria as Russia and Western powers face off over a suspected chemical weapons attack in Douma that sparked air strikes by the US, France and Britain. Russia requested the April 17 briefing on Syria’s northern city of Raqqa, where ISIS militants were defeated last year by US-backed forces, and the remote Rubkan camp for displaced Syrians near the border with Jordan and Iraq. 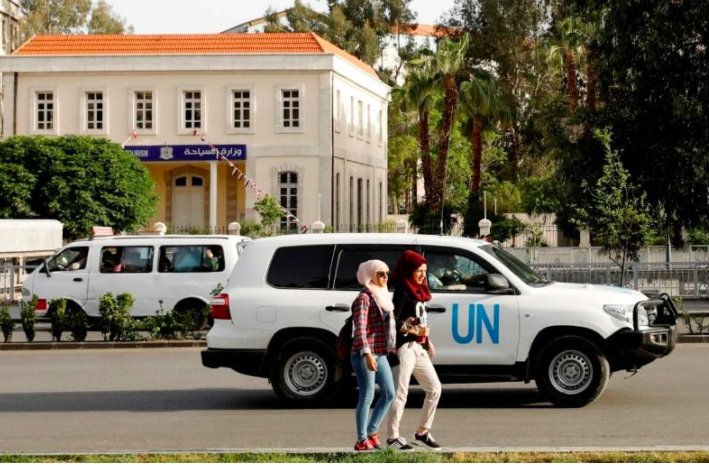 “Russia has called us here as part of a messaging campaign to try to distract from the atrocities committed by the (Syrian President Bashar al-Assad’s) regime,” Deputy US Ambassador to the United Nations Kelley Currie told the council. “In order to do that, Russia has asked this council to focus its attention on the one part of Syria where the Assad regime isn’t pummelling civilians to death with barrel bombs or banned chemical weapons,” she said. The Security Council has been deadlocked over how to replace a joint United Nations and Organization for the Prohibition of Chemical Weapons (OPCW) inquiry, which the council created in 2015 to establish responsibility for toxic gas attacks. That inquiry ended in November after Russia blocked three attempts by the Security Council to renew its mandate, slamming the joint inquiry as flawed. The inquiry found the Syrian government used the nerve agent sarin and had several times used chlorine as a weapon. It also blamed ISIS for mustard gas use. Rival US and Russian proposals to set up new inquiries into chemical weapons attacks in Syria were not adopted by the Security Council last week. France, the US and Britain then circulated a new draft resolution on Saturday that aims to establish a new independent inquiry into who is responsible for Syria toxic gas attacks. Initial talks were held on the text on Monday. Russian UN Ambassador Vassily Nebenzia rebuffed the new Western bid for an investigation. “The idea of creating a mechanism on attributing responsibility for the use of chemical weapons no longer makes any sense when Washington and its allies have already determined who’s guilty and in essence are already acting like self-appointed executioners,” Nebenzia said.